Wine is the lifeblood of Chablis. The vineyards can be seen from the heart of the village and you often see grape growers going about their business. Ah Chablis! That name conjures up all sorts of thoughts of stylish, sophisticated dry white wine. I love Chablis and think that the appellation / PDO has gone through a real renaissance over the last twenty years or so. There was a time when Chablis was frequently not what it ought to be and was instead a bit thin, green and tart. This seems to longer be the case and the quality of Chablis available seems to be generally pretty high in my opinion. Sadly so does the price – and that is before Brexit. What makes Chablis such a pleasure though is the complexity, the minerality and is that sense that you are drinking a true thoroughbred – a classic. So why should that be a cheap wine? How can it be a cheap wine? Cheap Chablis is always a disappointment and never shows you what Chablis should really be all about. 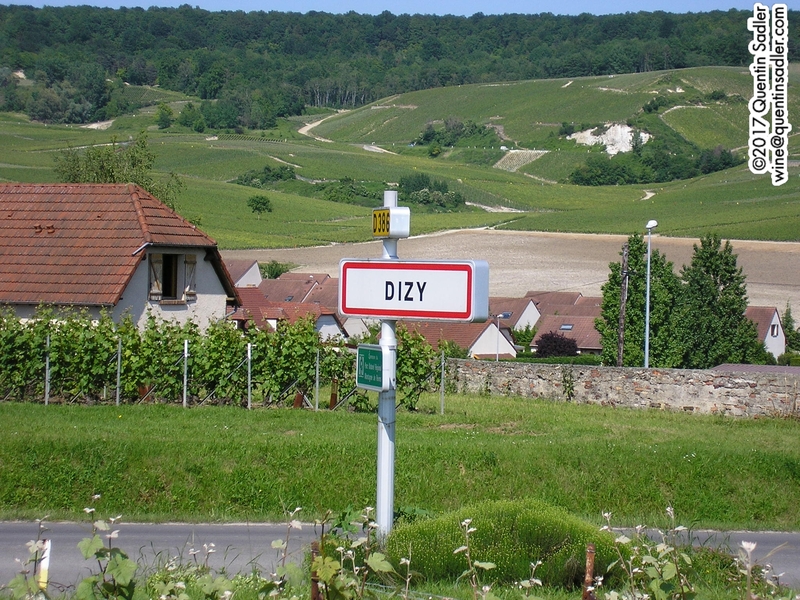 It is pretty much the northernmost outpost of the Burgundy wine region. It’s only made from Chardonnay (Beauneois to the locals). After that though it get’s a bit more complex because the differences are usually all about nuance rather than big, bold flavours. However the defining characteristic of Chablis should be all about the minerality in the wine. Minerality is the word we use to describe anything in a wine that does not come from the fruit or the winemaking. What actually causes these mineral characters is unknown and experts disagree – I have my own view that you can read about here – but they show themselves as stony, steely or earthy flavours and aromas. Chablis should smell and taste stony and that is the defining character of the wine style. It should have that sense of the fruit being restrained and the wine brooding in the glass – rather than overt fruit leaping out at you. There should be tension in the glass between the (gentle) fruit, the crisp acidity and that minerality. They all vie for your attention, so the wine should feel beguiling and complex. Drinking a good, or great Chablis, should be an occasion. 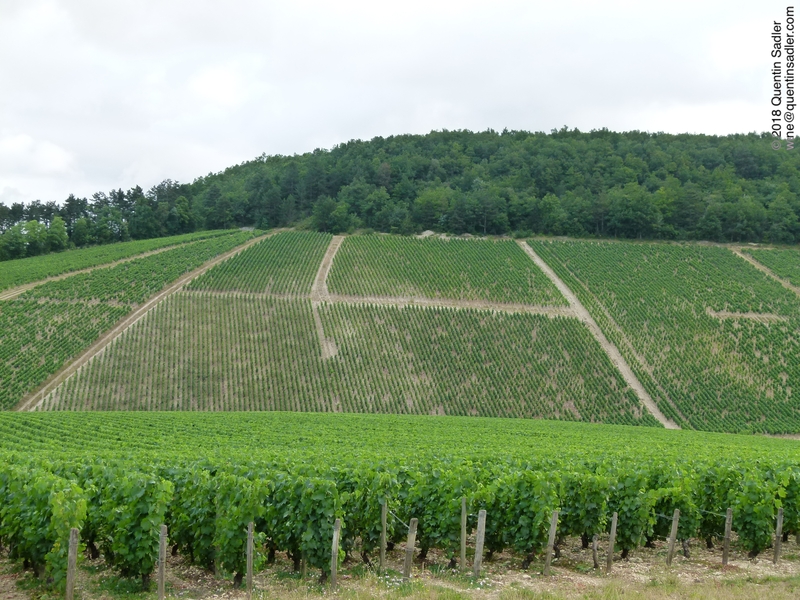 I will write another day about the higher levels of Chablis Premier Cru and Grand Cru wines, but there is another subdivision of Chablis and it often gets overlooked. That is Petit Chablis. I suspect very few of us go around actually knowing what Petit Chablis is, but it sells. 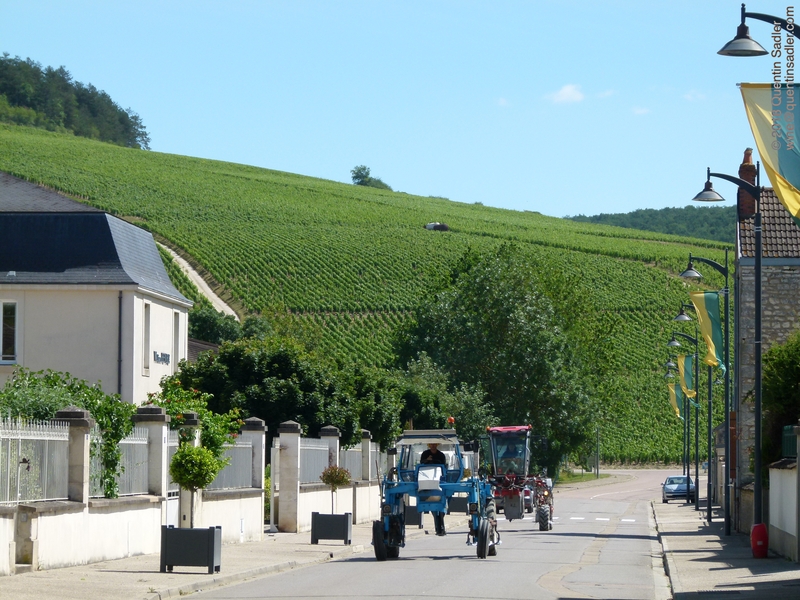 It sells almost certainly because consumers assume that it has a relationship to Chablis itself – which it does. Wine Map of France – click for a larger view. 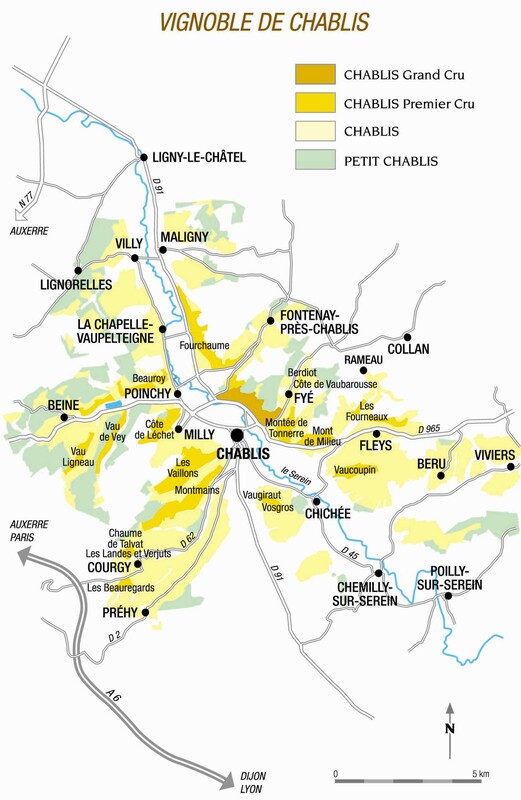 The vineyards of Chablis – map courtesy of the BIVB. The thing about Chablis is that it is really simple, pure even, until it isn’t. 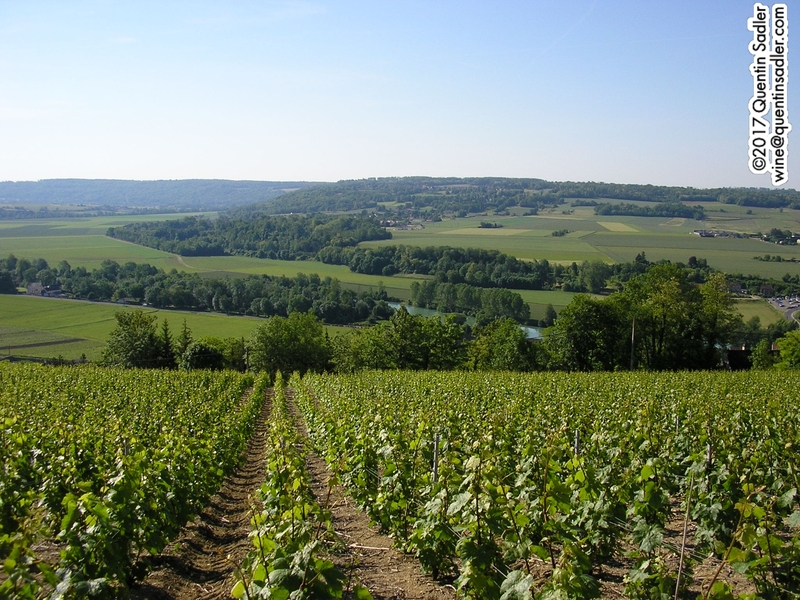 Chablis itself is all about the land in which it is grown. There are two important considerations with Chablis, the soil type the grapes are grown in and the aspect of the vineyard. 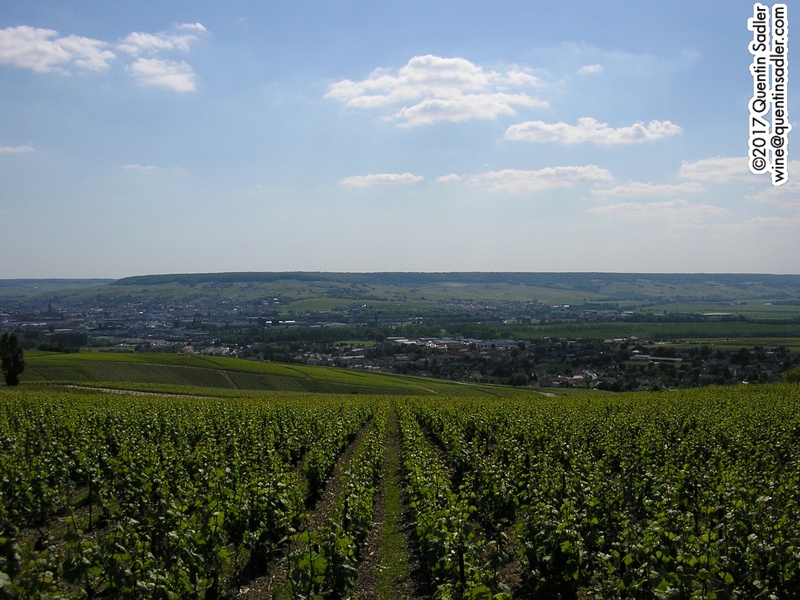 For a wine to be awarded the use of the Chablis name, or Chablis Premier Cru and Chablis Grand Cru, it must be grown in the vienyards around the (large) village of Chablis and be grown in the correct soils. These are a type of chalky limestone that was formed in the Jurassic era and was first identified in the village of Kimmeridge on Dorset’s Jurassic Coast. That is why the soil is known as Kimmeridgian, sometimes Kimmeridgian Clay. 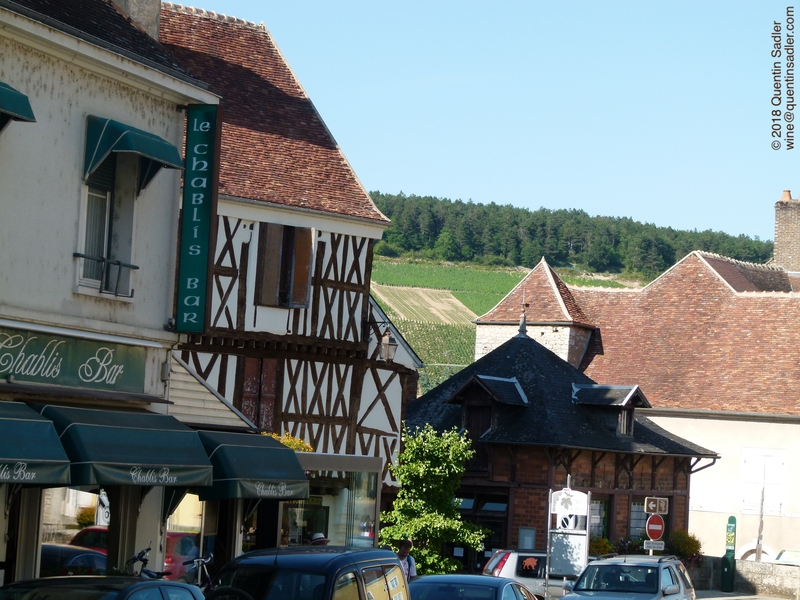 The village of Chablis with the vineyards behind. The whole area was once ancient seabed – under a warm and shallow sea – and that is why it contains millions of fossilised mussels and oysters. Chablis must be grown in this soil and it is believed that it is this soil that helps the wine take on that mineral character. 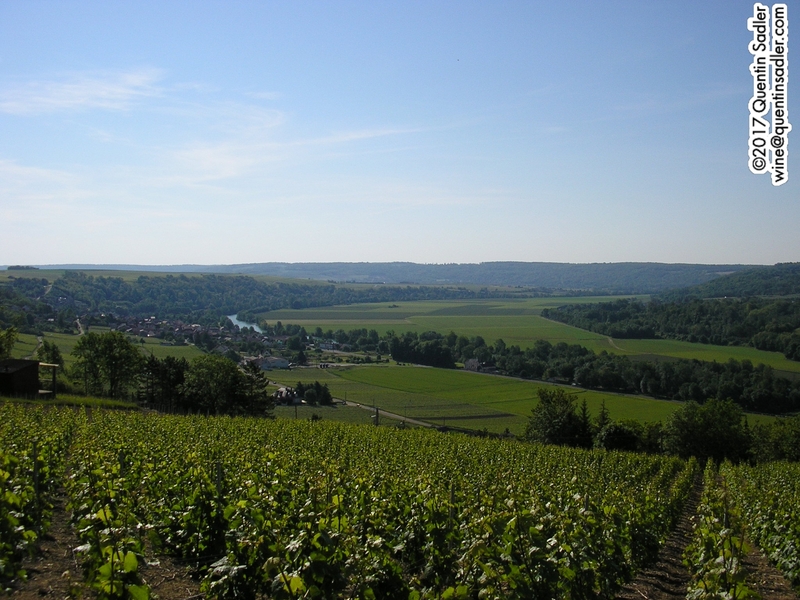 Chablis Premier Cru and Grand Cru must also be grown on Kimmeridgian soils, but in those instances they are on slopes facing south, south west or south east – this ensures they are riper than standard Chablis as the grapes get more sun. Not all the land around the village of Chablis is Kimmeridgian though. At the top of the slopes there is a harder soil called Portlandian Limestone. It would be a waste not to plant anything in this soil, but there is no avoiding the fact that wine produced in these soils is different from Chablis – even if the same grape variety, Chardonnay, is used. That is why the wines grown in these soils are called Petit Chablis, so that we know they are different and perhaps that we should not hold them in such high regard as Chablis itself. Traditionally we have been told that Petit Chablis is not mineral, instead it is is more fruity, but still crisp and dry. Broadly speaking I would say that is true, although it isn’t quite as clear as that makes out. Recently I have noticed that the quality of Petit Chablis seems to be very good right across the board – just like Chablis itself. 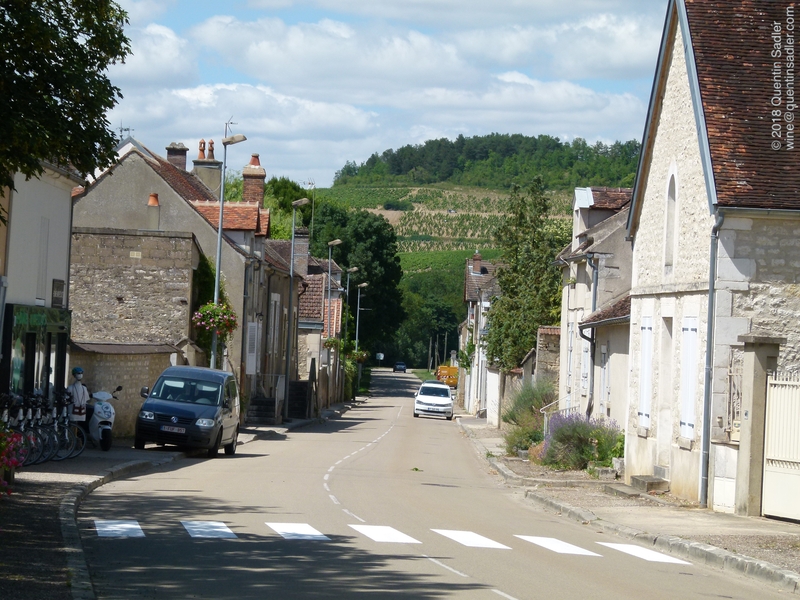 Chablis is a lovely place to visit. I have to be honest that until a few years ago I was barely aware of Petit Chablis existing, let alone understanding what it was, so my experience of it has all been in the last three or four years. In that time though I have noticed more and more that the wines are on the whole consistently good quality and often fantastic value for money. It really does seem to be a very reliable appellation, I have tasted a good few of late and they all seem to deliver a classy glass of wine. In fact they might be a perfect reliable classic French dry white wine to fall back on now that the likes of Chablis and Sancerre have become so expensive. Petit Chablis has certainly become something of a house wine Chez moi and something that I frequently order when dining out. 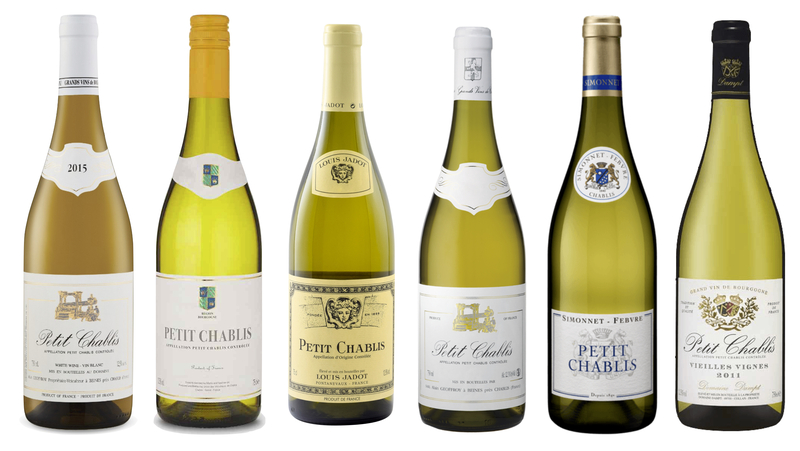 At their best – and all these are very good – Petit Chablis is crisp and refreshing with apple, orchard fruit, some light creamy notes and lots of acidity as well as a little touch of that minerality for which Chablis is so famous. They are of course unoaked so remain bright and lively, so would appeal to Sancerre, Pouilly-Fumé and Sauvignon Blanc drinkers as well as lovers of White Burgundy. Anytime you want a true classic French dry white wine, then Petit Chablis seems to me to be a good bet. Please ignore the word Petit in the name, these are all wines that deliver great big dollops of pleasure. 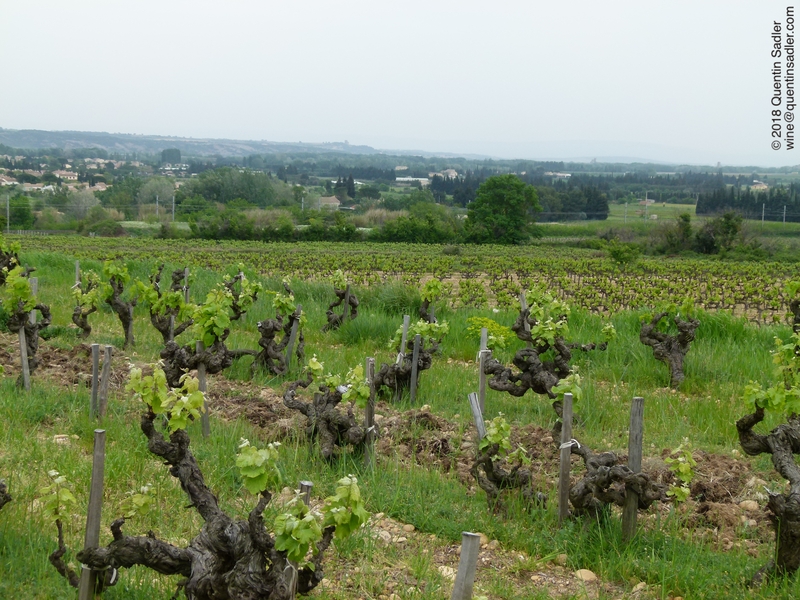 Vines at the beautiful Domaine des Escaravailles. Think Côtes-du-Rhône, think red wine, that was their advertising slogan for quite a few years and indeed the popular perception would be that the Côtes-du-Rhône is all about red wines. 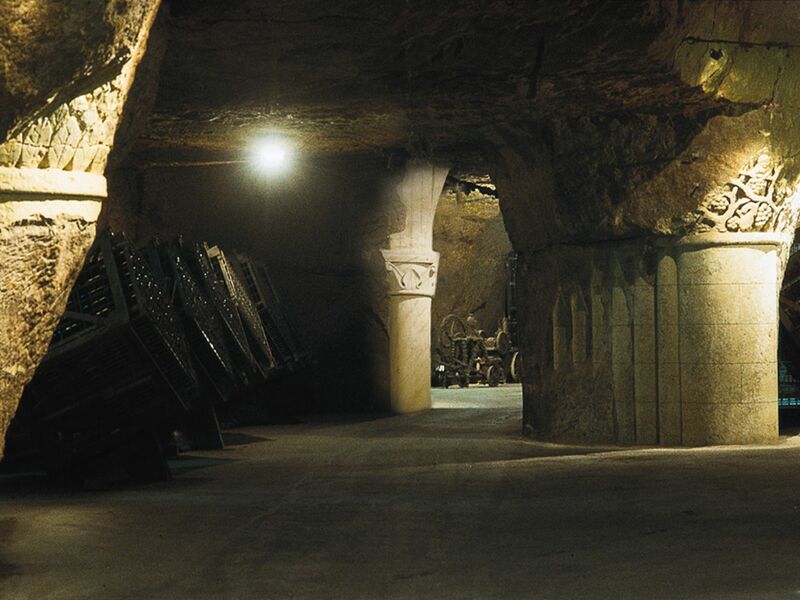 Which is understandable as this region of France produces a lot of wine – 372 million bottles or so a year in fact, but only 6% of that total is white. A lot of places are like that – Bordeaux and Rioja for instance – the red wines get all the glory and all the column inches and I can understand it, but it limits people’s appreciation of some wonderful wines from these places too – the whites. 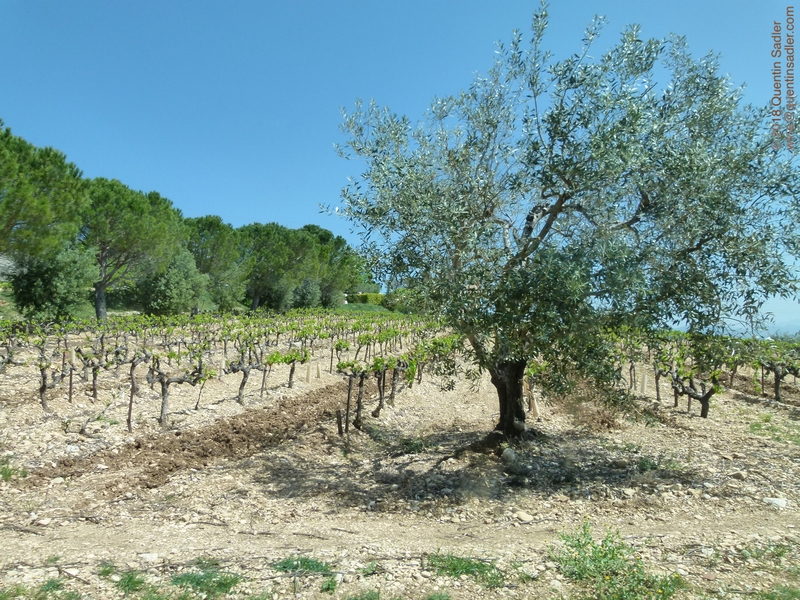 Recently I was travelling around the southern Rhône Valley where I visited some fabulous estates and tasted some brilliant wines. It may have been because of the hot weather, or because we were given quite light food to eat, but very often the wines that caught my imagination the most were the whites. 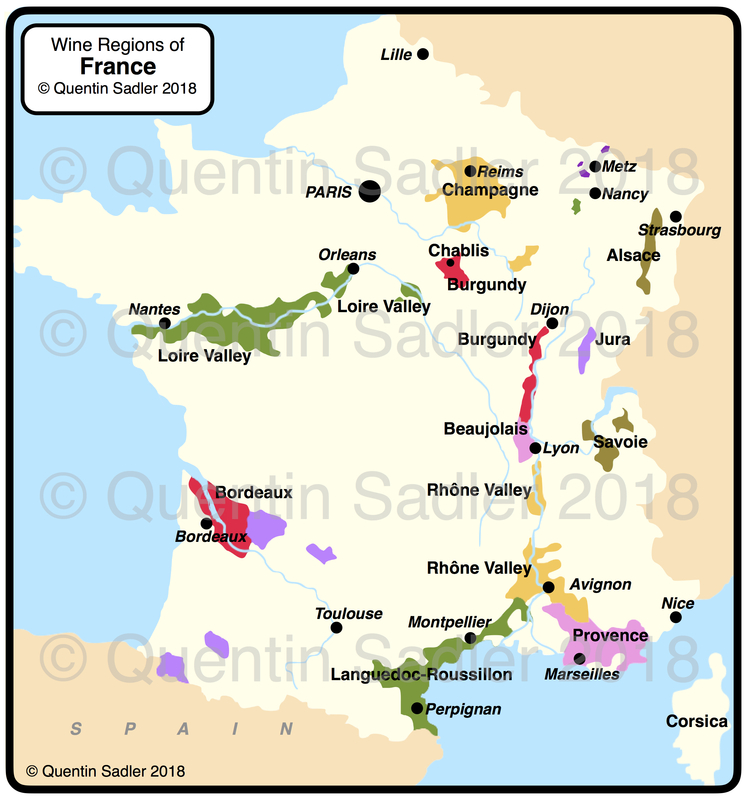 The white wines of the southern Rhône are usually blends made from Marsanne, Roussanne, Grenache Blanc, Clairette, Picpoul Blanc and Bourboulenc although Viognier gets a look in as well. I love these grapes, well except for Viognier, as they are full of character, flavour and interest. Single varietals are permitted, although most white wines here are blends of more than one grape variety. These grapes are also widely used in the Languedoc-Roussillon region of course. The dramatic southern Rhône landscape. Grenache Blanc – it is Spanish in origin so should be called Garnacha Blanca (Garnatxa Blanca in Catalan) – has become one of my favourite white grapes in recent years. Which is odd for me because it is relatively low in acidity, but handled correctly can still offer enough freshness to balance the alcohol and the aromas. Historically it was not widely respected, but modern, cold fermentation, techniques keep that freshness and bring out the lovely herbal aromas and flavours and it also has a silky texture that can be very satisfying. Roussanne is also favourite of mine and is another aromatic and herbal scented grape variety that has a nutty character too. The wonderful thing about Rousaanne is though that it has loads of flavour and aroma but also reasonably high acidity, so the wines feel fresh – even when blended with Grenache Blanc. Marsanne is a much fleshier and lower acid grape and can make big and flabby wines unless care is taken – which is why it is so seldom seen a a grape variety on its own, although even they can be superb. 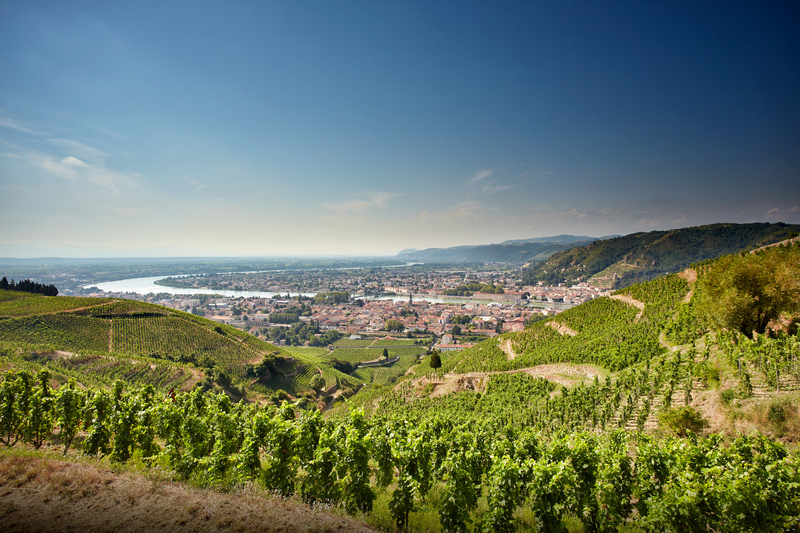 Like Roussanne – which which it is often blended – Marsanne also originates in the northern Rhône. Bourboulenc is a grape variety that I have really come to love in recent years. It is widely grown in southern France, being used in Bandol, Cassis, Châteauneuf-du-Pape and La Clape in the Languedoc amongst other places. It has good refreshing acidity and good citrus flavours too and while almost never used on its own can really give some elegance and finesse to a blend of richer grapes. Clairette is a fascinating grape. It is low in acid and can be flabby unless care is taken. This is another herbal grape with fennel like aromas and rich orange and peach flavours.In the Rhône this is a blending grape but it is used as a single varietal in Clairette du Languedoc with great success – see here. Viognier of course is by far the most popular and widely seen of these grapes. 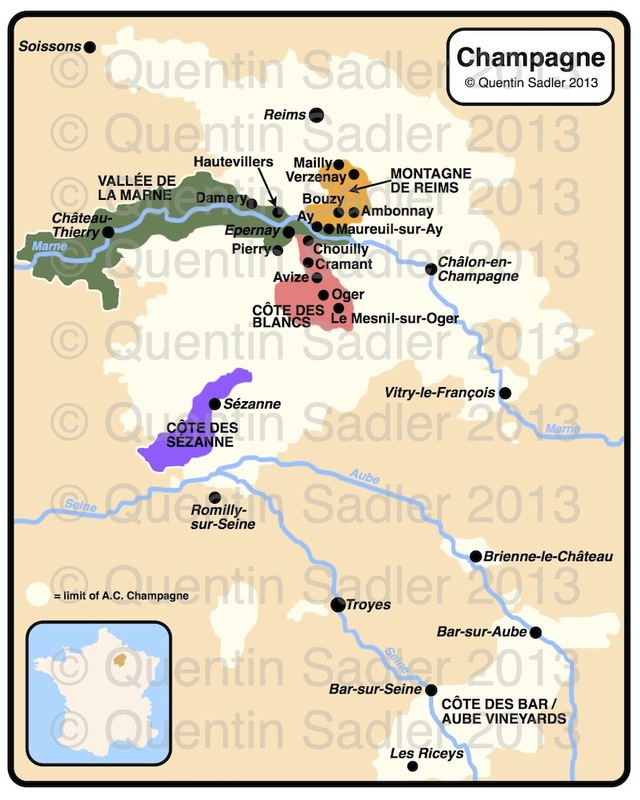 Generally low in acid and very intense and oily in its home turf of the northern Rhône, where it makes Condrieu. Personally I do not usually like the grape unless it is a lighter fresher example, but a little in blends can work. These wines are very food friendly and partner all manner of dishes very well. Perfect with roast chicken, fish dishes, but also brilliant with roast lamb as long as you pile on the herbs and garlic – garlic works very well with Roussanne and Grenache Blanc especially, as does olive oil. They are also perfect with a cheese board and what I usually serve with a selection of cheeses that includes both hard and softer types. Vines at the Château de Montfaucon. One of the absolute highlights of my trip was the Château de Montfaucon who are based near Châteauneuf-du-Pape and mainly produce Côtes-du-Rhône and Lirac wines – Lirac is another Cru of the Rhône like Châteauneuf but less well known. They farm organically, although are not yet certified and the range was thrilling from top to bottom, but it was the whites that especially drew me. This wine is a blend of Marsanne, Clairette, Grenache Blanc, Viognier and Picpoul Blanc and the proportions vary quite widely each year. The greater part was the Marsanne and Grenache Blanc and these components were barrel fermented and aged on the lees, but with no lees stirring as the wine is textured enough naturally. 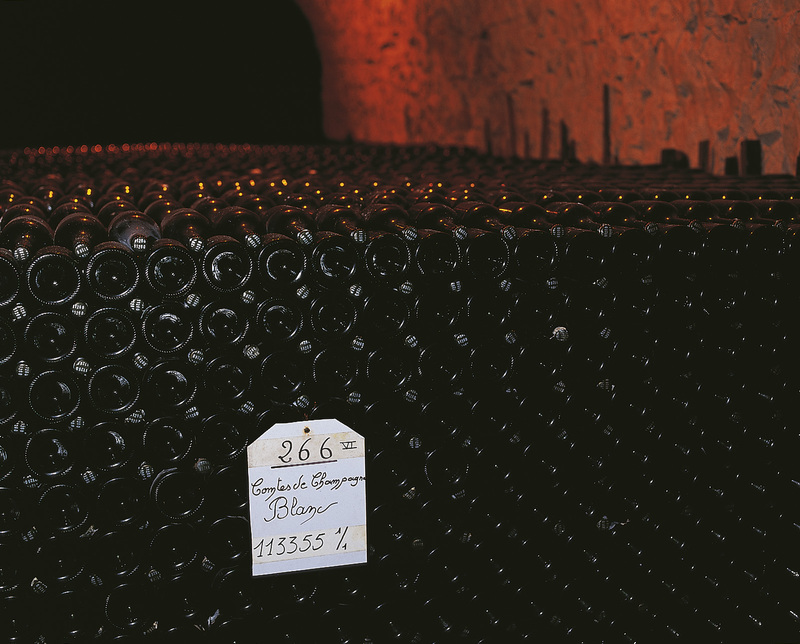 It is all spontaneous fermentation with no added yeast, which also adds to the texture of the wine. For me this is a beautifully complex and pleasurable wine with, smoke, toast, grapefruit, apricot, just a touch of oiliness and that tangy acidity in the background. The palate is beautifully textured, almost mealy, with fresh pear and nectarine fruit and beautiful balance. The finish is surprisingly savoury and saline and has great length – 91/100 points. The equally fabulous 2015 is available in the UK for £13.50 per bottle from the Wine Society. 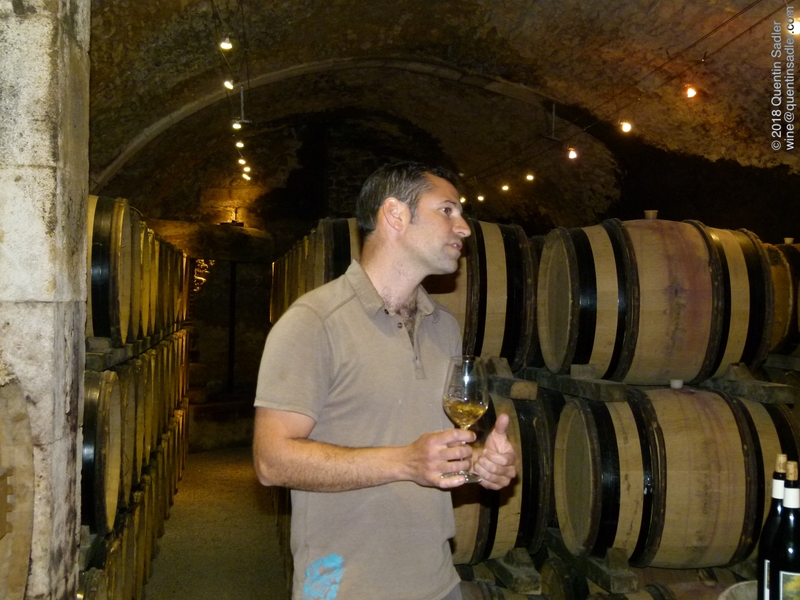 Winemaker Julien Thorn in the magnificent cellar at Château de Montfaucon. Basically this is made from a single plot of ancient Clairette vines planted in 1870 in very stony and sandy soils on Mount Peguierol, overlooking the river Rhône near Montfaucon. They only make 7 or 8 barrels and it is fermented in oak barrels and aged in them for a few months afterwards with no lees stirring. The label is a rather wonderful old one that was created for the estate back in 1829 and they claim it is the oldest Rhône label of all as very few wines from this region were bottled until well into the twentieth century. Complex aromas of pastry, apricot, fennel, annis, apricot strudel, truffles and buttery grilled almonds. The aroma is heavenly and oozes style. The palate is luscious and rich with just enough acidity and freshness to balance the full and succulent mouthfeel. There is a touch of bitterness and a touch of struck match too, while the finish is lightly oily and creamy with something mineral and saline and a long lingering flavour of orange, apricot and a little peach. Quite a wine – 93/100 points. I cannot find any stockists for this, but it is well worth seeking out. 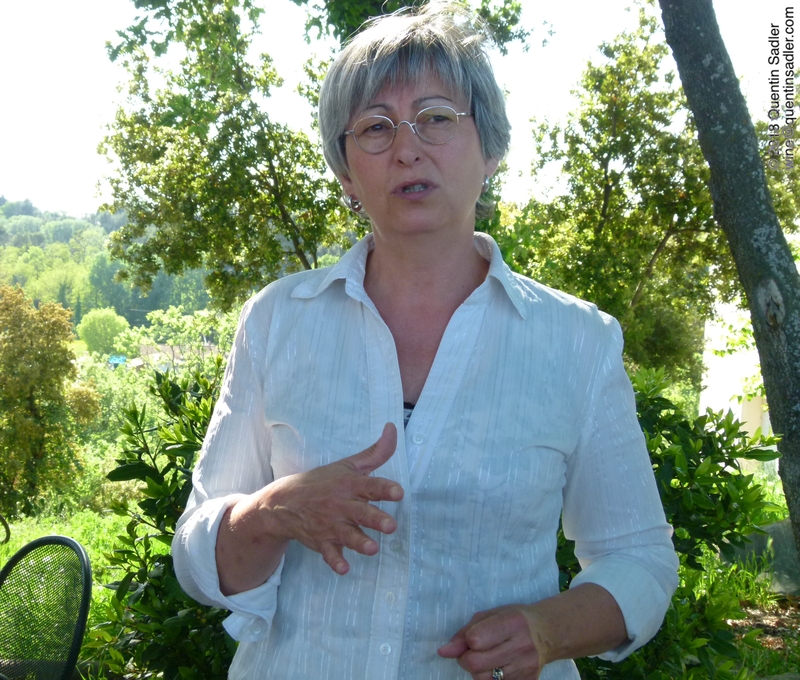 Christine Saurel at Domaine Montirius. 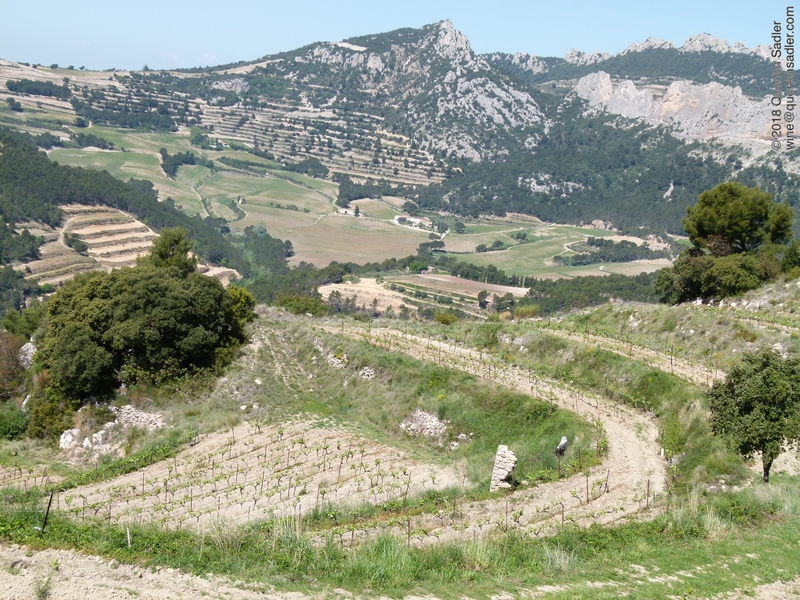 Only 3% of Vacqueyras, yet another Cru of the southern Rhône, is white. 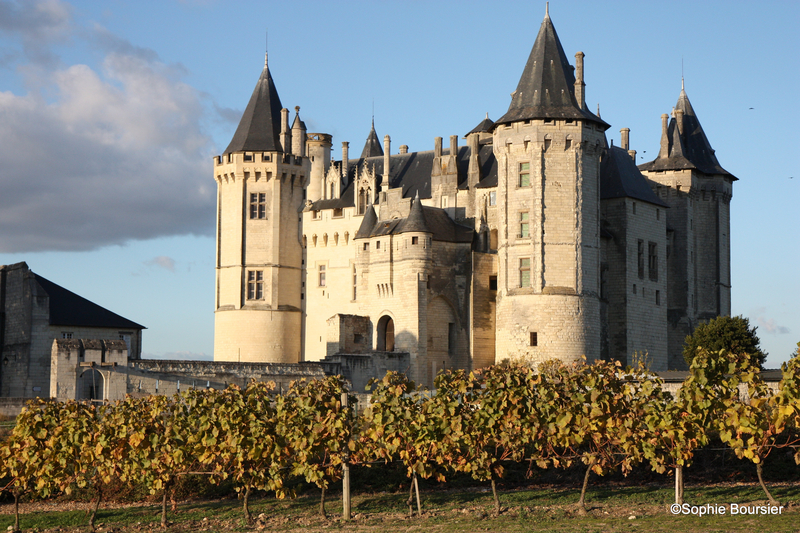 This great estate is run with passion and precision by Christine and Eric Saurel. 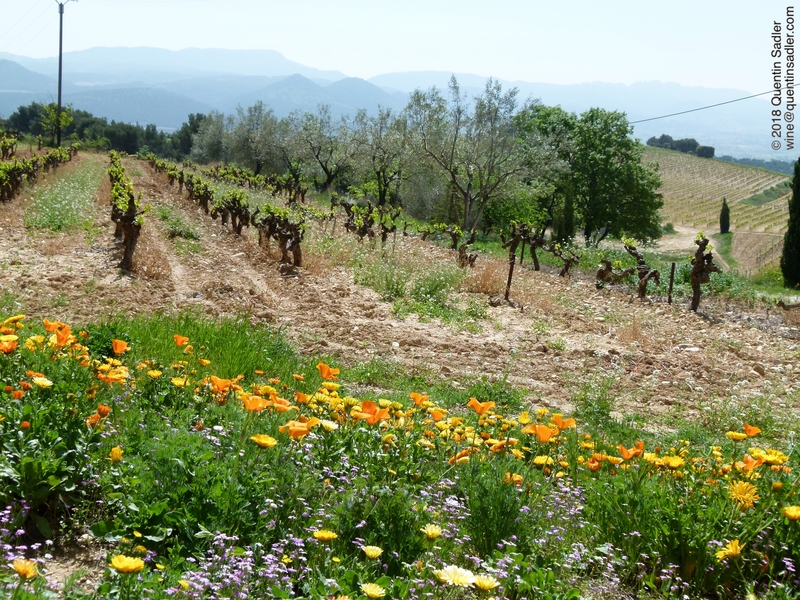 Originally members of the local cooperative they went biodynamic in 1996 – their families thought they had joined a sect – left the cooperative once they had failed to persuade them to convert too, and never looked back. Christine was our host as Eric was busy in the cellar but wow she feels passionately about how the estate is run, telling us that with biodynamics that if something has to be done it has to be done right then in the moment otherwise it can go wrong. They have used no oak at all since 1999 and aim for wines that are authentic and minimalist, just as I like them. I was hugely impressed with the whole range here, especially the Vacqueyras Minéral Blanc, which is a blend of 50% Bourboulenc with 25% each of Grenache Blanc and Rousanne fermented in stainless steel with a spontaneous fermentation. Really the only thing they do is to introduce oxygen into the fermentation to stop reduction spoiling the pleasure of their wines. Rather intriguingly the Grenache Blanc and Roussanne were co-fermented – picked together and fermented together and then blended with the Bourboulenc. This has a great nose, floral, citrus, nutty and honeyed with deep citrus, orange and lemon peel notes. The palate has tangy grapefruit acidity and a lively texture too. Very complex with vanilla, floral, citrus, wax, lemon curd, great fruit concentration and a taut mineral quality. The finish lasts a good 2 or 3 minutes. This is a fine and beautiful wine – 93/100 points. Available En Primeur for £195.00 per dozen bottles plus duty, shipping and VAT from Laithwaite’s. This pristine estate is the focal point for the Bernard family who have been making wine in these parts since 1794. They only bought this perfect picture postcard Château in the 1990s but it is the family home and main winery for the company that makes Côtes-du-Rhône and Châteauneuf-du-Pape wines. Their range is solid and well made, but the high point was this relatively humble white Côtes-du-Rhône made from 25% Clairette, 25% Grenache Blanc 25% Roussanne, 20% Marsanne and 5% Bourboulenc. It is fermented in stainless steel and completely unoaked and has no malolactic fermentation either. This is a lovely, joyous wine, full of freshness that makes it feel lively and pure. The palate is concentrated and rich but that purity keeps it refreshing too. The herbal characters and orchard fruit of the grapes together with some lemon curd notes make it delicious and moreish – 89/100 points. The equally fabulous 2016 is available in the UK for £13.50 per bottle from the Huntsworth Wine Company, London Wine Shippers and D’Arcy Wine Merchants. Pure Viognier from 20 year old plus vines, farmed organically but not certified as such. The grapes were pressed and juice put straight into oak barrels, second and third use. The wine was fermented and then aged in the barrels for another 6 months on the lees. Now I am not really a fan of Viognier, but this is an attractive wine, delicately creamy and smoky with some nice peach, floral, herb and peach stone characters. It has a lightness of touch enough to keep it fresh and lively and drinkable – very well made wine – 87/100 points. The equally fabulous 2016 is available in the UK for £14.75 per bottle from Private Cellar. 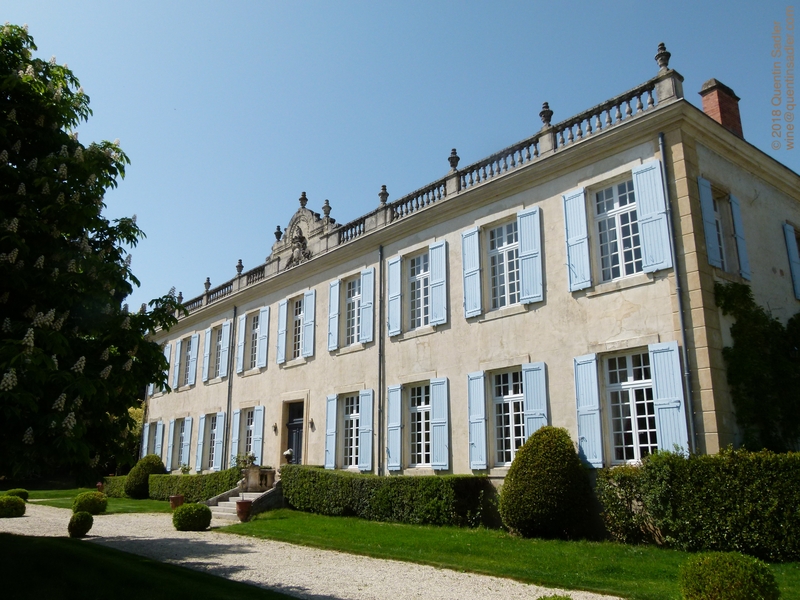 The beautiful and peaceful Domaine des Escaravailles. 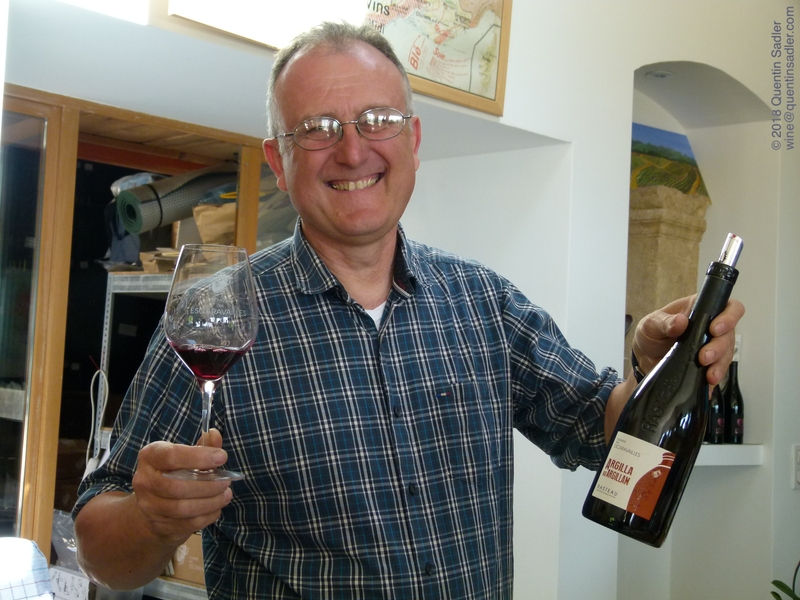 Gilles Férran of Domaine des Escaravailles, he is as charming and funny as he looks! Domaine des Escaravailles is an amazing place. It is a beautiful spot up steep and bumpy country lane. It seems very cut off and the peace somehow prepares you for the wines to come. The story began in 1953 when Jean-Louis Férran bought several parcels of vines in the Rasteau, Cairanne and Roaix areas of Côtes-du-Rhône. 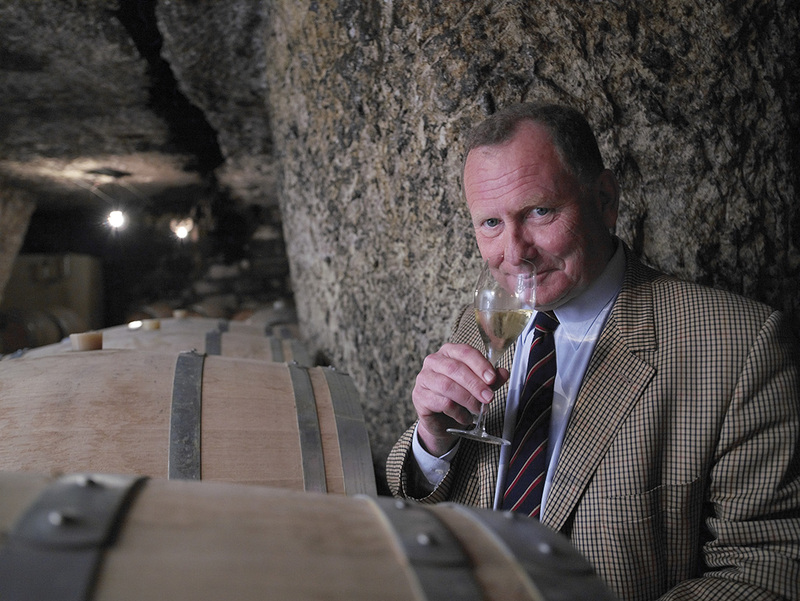 In 1999 his grandson Gilles took over and made the estate what it is today. They farm using sustainable techniques and most of their vineyard sites – at around 250 metres above sea level – are relatively high and cool. As a consequence they seem to make lovely silky and refined wines that are elegant and balanced and never too powerful despite their generous fruit. Escaravailles by the way is the local Occitan name for the scarab beetle as well as a nickname for the local black robed monks who inhabited a swathe of local monasteries before the revolution. This is a blend of 40% Roussane, 40% Marsanne and 20% Viognier, barrel fermented and aged in the same barrels for some 6 more months, with lees stirring to help develop complexity and texture. 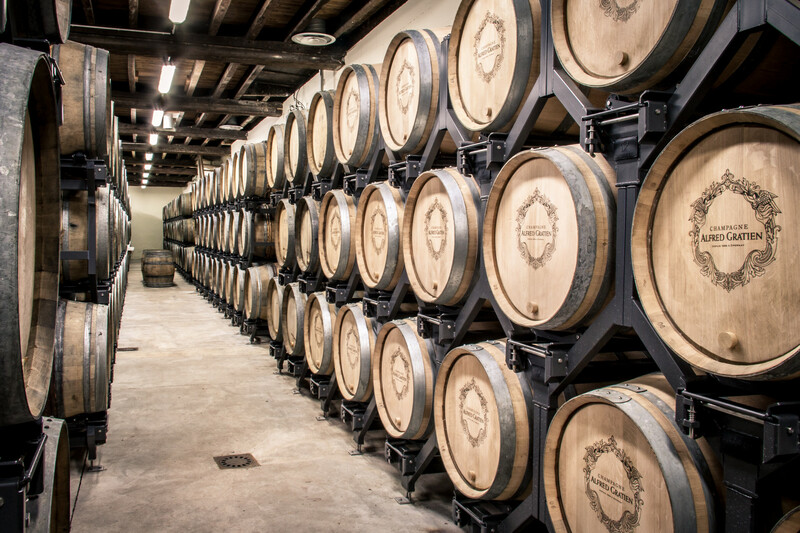 26 barrels were made and 4 of those were new oak, so once the wine was blended only a little new oak was used in the whole wine as they do not want the oak to dominate, merely to add some spice and structure. The vineyard this wine comes from is actually within the Cru of Rasteau, but for some odd reason only red wines and rosés can be made in Rasteau, so it has to be labelled as Côtes-du-Rhône instead. Great aromas of herbs together with peach, blossom and sea salt. In the mouth it has a beautiful palate with great, lush, texture, dense fruit, cooked and fresh peach, apricot, pear and apple together with some lovely herbs and spices and a feel of some wild honey . The finish is long and rich but also fresh and lively, giving it tension as well as making it delicious and sinfully drinkable – 92/100 points. The equally fabulous 2015 is available in the UK for £22 per bottle from the Wines With Attitude, Butlers Wine Cellar and Bowland Forest Vintners. So you see, the Côtes-du-Rhône is not only red. There is a wealth of fine white wines from the southern Rhône and they are well worth exploring as they are often very good indeed. 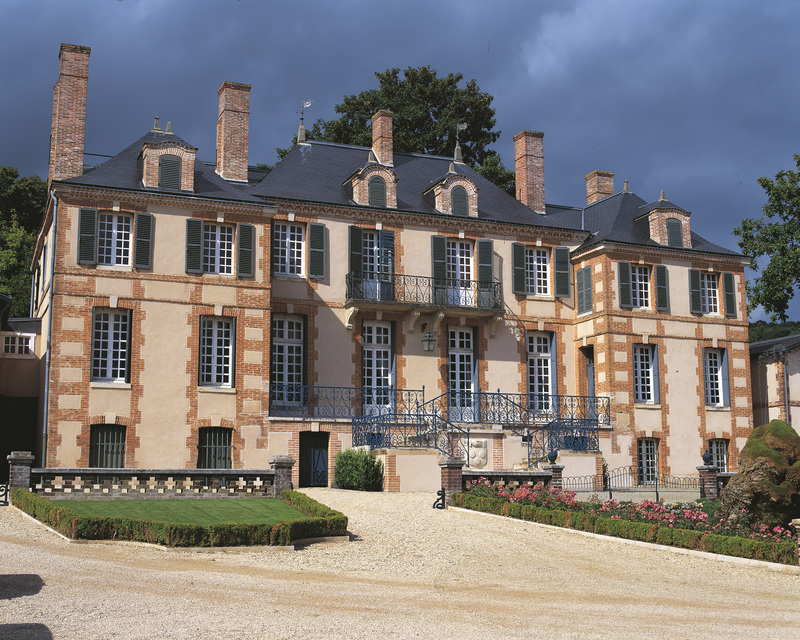 Tain-l’Hermitage – photo courtesy of Maison Les Alexandrins. Personally I think a lot of talk and writing about wine – and I am guilty of this myself – focuses on how fine, interesting or different a wine is rather than how much pleasure it delivers. Which is really very strange as wine is all about pleasure isn’t it? If a wine does not give you pleasure, then what is the point? I certainly think about the pleasure a wine offers while I am tasting it but do my descriptions and writing about a wine always convey that? I am not sure. All of this flashed through my mind recently when I tasted a wine that in more normal circumstances I might well have ignored. For a start it is made from Syrah, or that is what it says on the label anyway. Be prepared to gap in astonishment, but I am not especially drawn to Syrah, or don’t generally think I am anyway, so rarely seek it out – although that seems to be changing. 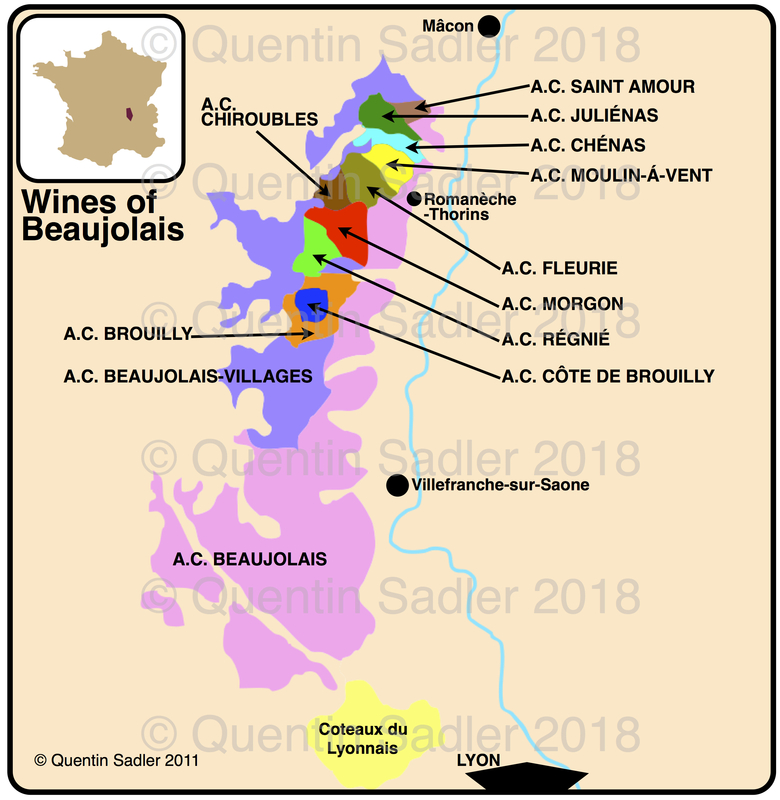 Secondly the wine is not from an appellation contrôlée / AC / appellation d’origine protégéeor / AOP / PDO or not even a Vin de Pays / PGI, but is a humble Vin de France. This most basic quality level of French wine replaced Vin de Table a few years ago, with similar changes right across the EU. Fundamentally what changed was that they were given the right to state the grape variety, or the blend on the label. They are also allowed to show the vintage, which means that we can be more selective, choosing the better vintages and perhaps also the fresher years – especially useful with white wines, but a good idea with most modern red wines too. The vast majority of Vin de France are, as you might imagine, pretty basic, everyday wines – which is why I would normally pass on by. However, as with the Syrah that I tasted some producers use this level to make something altogether more interesting and worthwhile. Certainly this Syrah is a lovely wine – so good in fact that I have made it my Wine of the Week. 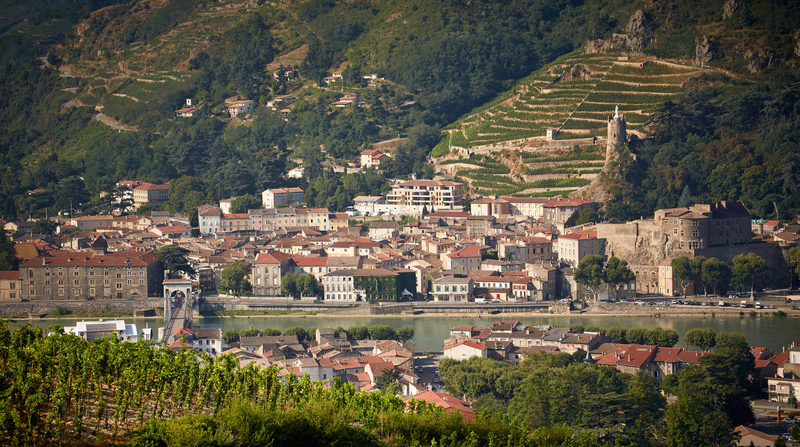 The stunning Northern Rhône Valley – photo courtesy of Maison Les Alexandrins. 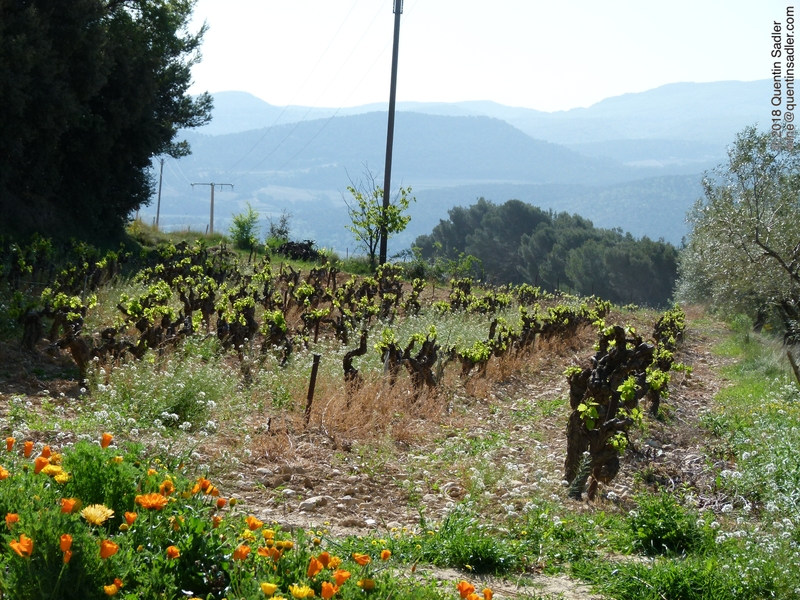 Maison Les Alexandrins is a very interesting project that produces some rather good wines. 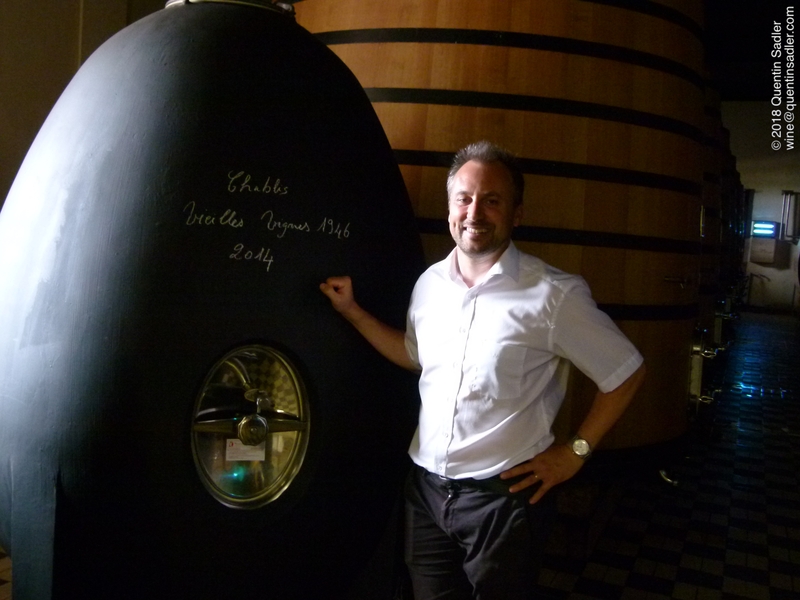 It is another example of a thoroughly modern phenomenon – a micro-négociant that focuses on high quality wines. It grew out of the Domaine Les Alexandrins and is a joint venture between Nicolas Jaboulet, formerly of the eponymous winery in Tain and now the head of Maison Nicolas Perrin, winemaker Guillaume Sorrel and viticulturalist Alexandre Caso. 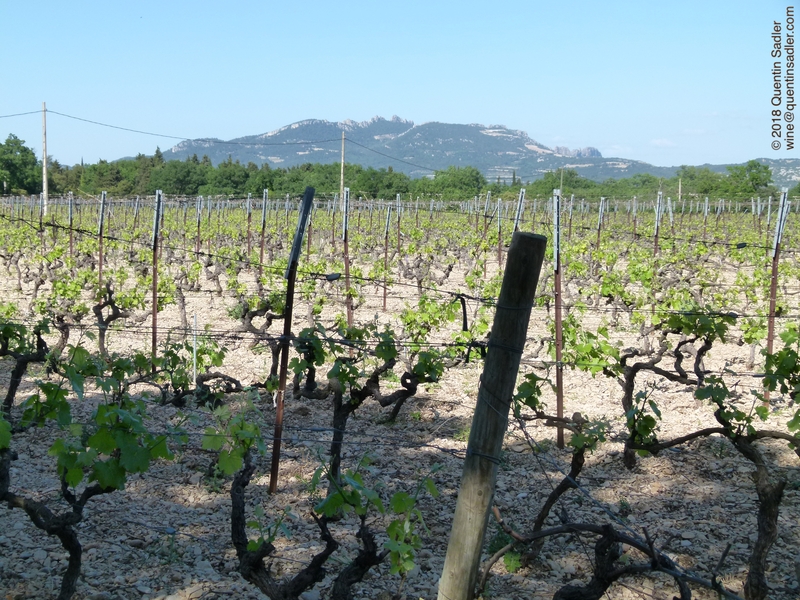 The aim is to give Nicolas Perrin a presence in the Northern Rhône and they aim to buy really good parcels of fruit from top growers across the area and to craft expressive wines from them. Eventually they will have a permanent base as they are building a new winery in Tain-l’Hermitage. 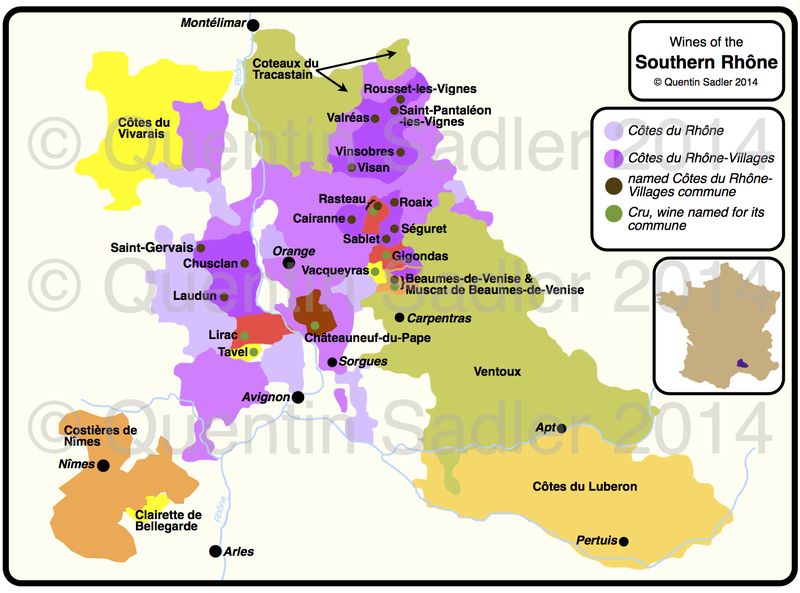 Wine Map of France, the Northern Rhône is just south of Lyon – click for a larger view. This is the bottom rung of the wines they make, but don’t let that bother you. It comes from a great vintage and the quality shows, but so does the skill of the winemaker. The fruit comes from younger vines across the Northern Rhône and although the label calls it a Syrah, there is actually 8% Viognier in there too, co-fermented with the Syrah. There was a cold soak to extract flavour before the fermentation which was in stainless steel. Half was then aged in tank for 6 months and the other half was aged in barrel, but from the taste of it I would say very little new wood at all. Everything about this wine is bright and fresh. The colour is a vivid cerise – like a sorbet. The nose gives bright cherry and blackberry with lightly creamy notes, some spice and a little touch of freshly turned earth. The palate just delivers pure pleasure. It is fresh, fleshy and juicy and cram packed with bright cherry, cranberry and plum fruit together with bright, refreshing acidity and just enough soft tannins for interest. It is beautifully balanced, perfectly judged, delicious and dangerously hedonistic. All in all it is a fine bottle of really well crafted happy juice. This is a lithe, fresh and punchy red that will go with almost anything and is a very attractive wine to drink on its own too. Personally I think its charms are mainly upfront in the fruit, but it might be interesting to see what it’s like in five years or so as underneath all that pleasure I am sure there is a more serious wine trying to get. This is so delicious, so drinkable and made me so happy that I will award it 90/100 points – it earned extra points for severing extreme pleasure. Available in the UK for around £13 per bottle from South Downs Cellars. More stockist information is available from Liberty Wines the UK importers. Frankly the only mystery about this wine is why it does not have more stockists. Sealed with a screw cap it would make a perfect restaurant wine too. 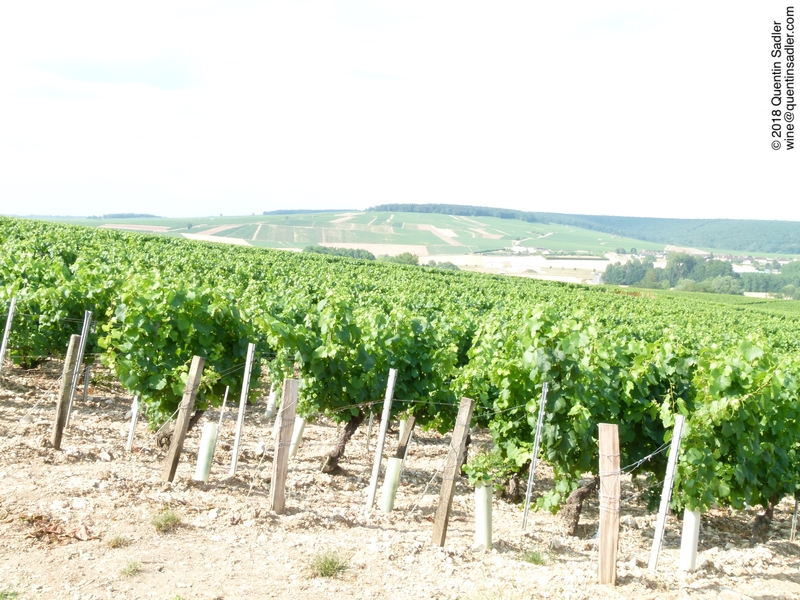 Vineyards in Chablis showing the light, stony soils. 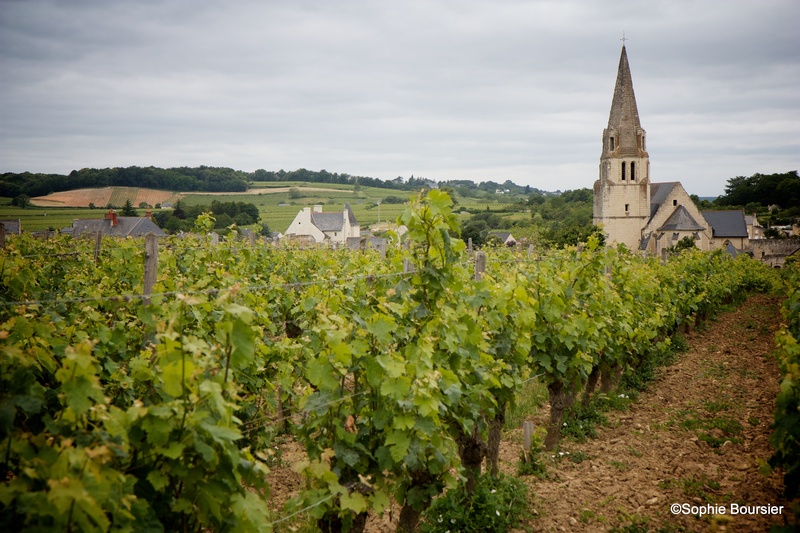 Chablis, one of the most famous wines in the world, is widely known and highly prized. I also think that, like many very famous wines it is deeply misunderstood. My parent’s generation venerated Chablis and both my father and my father-in-law waxed lyrical about any dry white wine as being like Chablis. I know that all the books and courses bang on about Chablis being crisp and dry and high acid indeed, but I think that misses the point as to what Chablis really is. 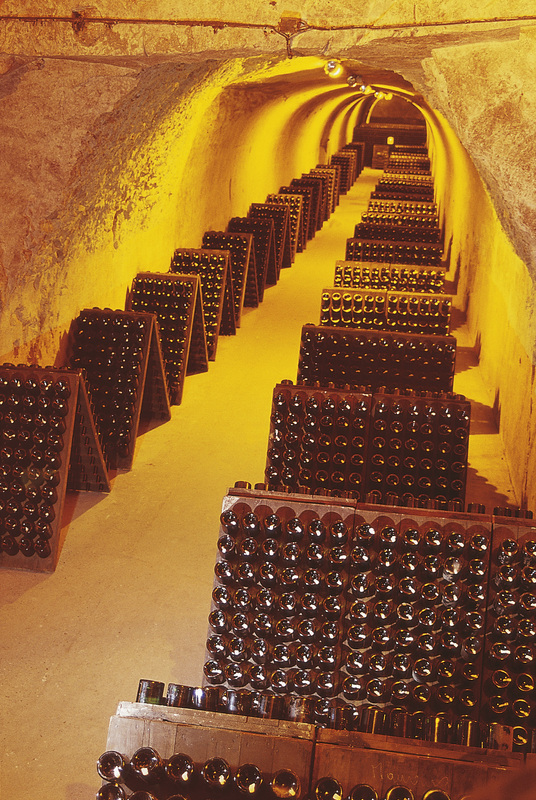 The trouble is that with these really famous wines we all tend to drink the better value – cheaper – examples down the bottom of the range – most of the time anyway. These wines are made to a price and not as concentrated as the genuine article. So most of us drink dilute Châteauneuf-du-pape, St Émilion, Sancerre and, yes Chablis, much of he time. Which is a great shame as it does classic french wines no favours and might well be one reason why so many people that I meet at wine events claim not to like French wine. Basic Chablis is often just crisp, green and acidic and bears only a paling resemblance to the complex wines that you can have further up the food chain. Well the other day a ‘basic’ Chablis came my way and it pleased me greatly. It was a real Chablis at a great price and I liked it so much that it is my Wine of the Week. Chablis of course comes from Northern France and is one of the most northerly fine still wines that there is. It is a complete fluke of a place really. 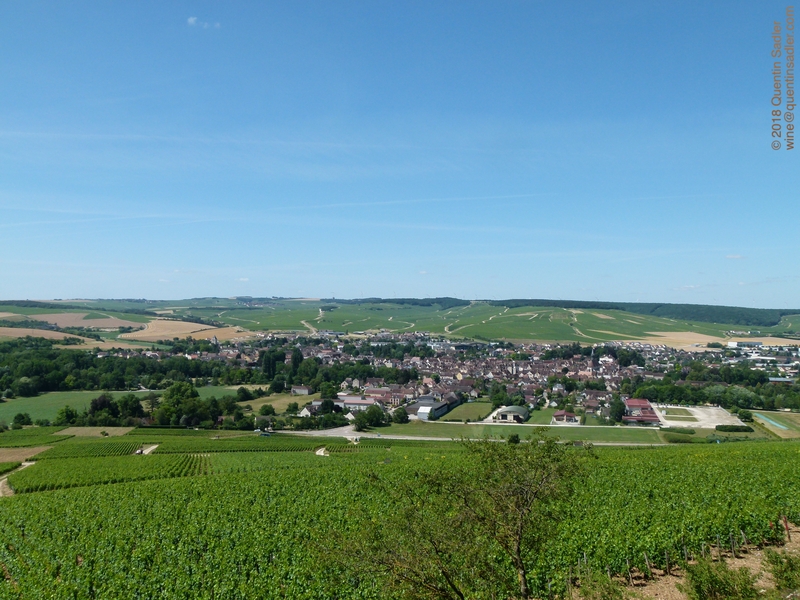 Nowhere else around there has the south facing hills that allows the Chablis producers to coax full ripeness out of the grudging Northern European sun. Actually that is a bit mean of me as it can get pretty hot there, but not for long and the winters can be pretty extreme, but that’s continental climates for you. As a consequence you will never get big, rich, bold wines this far North. Instead you get something just as exciting, when everything goes right anyway, but very different. In fact it is a fascinating lesson in terroir as the rest of Burgundy is only just over 100 km away but makes very different wines because the climate is that little bit more generous. Just as with Champagne, Chablis is only about the fruit in passing. Instead the whole point is the freshness, the minerality and the nervy quality of it. It is those subtleties that sadly often get lost in the cheaper versions, leaving just the green tart fruit and acidity – not in my Wine of the Week though. 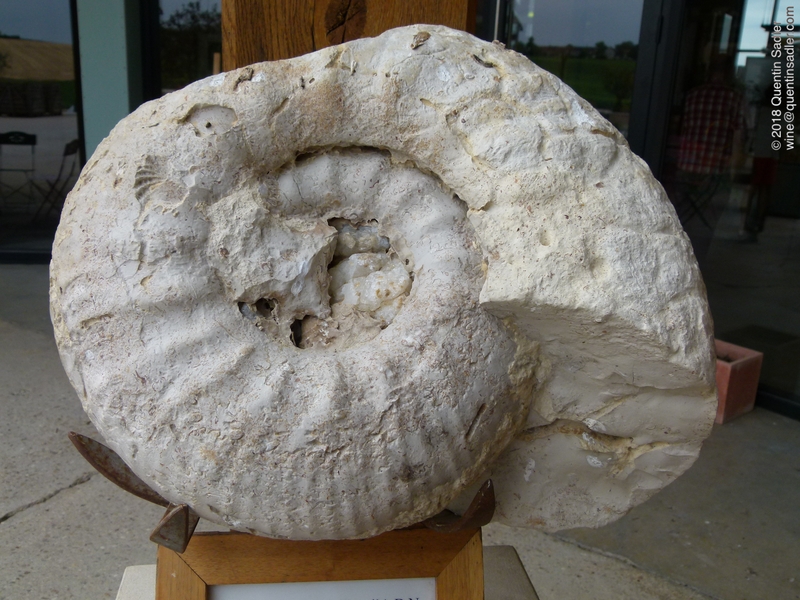 Chablis has fossil rich Kimmeridge Clay soils and this ammonite fossil is typical of what they find in the vineyards. I always think it is such a shame that so many people have a view on Chardonnay that simply does not do the great grape justice. Chardonnay is not always oaky, sweetish and gloopy, indeed almost always is not nowadays, but many consumers retain a view of it of old. Perhaps trying this classic very unoaky and fresh style of Chardonnay might change their mind? The Co-op actually produce a good range of exemplary own label wines and this is an excellent example. What’s more if you read the back label of the wine is states that it is bottled in Péhy, which is just 5 km outside the village of Chablis and is home to one of the area’s great producers, Jean-Marc Brocard and this wine is indeed made by him. Brocard makes beautiful Chablis and this gives a good introduction to this style of zesty, unoaked Chardonnay. In the glass it glistens with a sort of limey gold – so richer than you might expect. While the aromas offer floral notes, hints of honey, a few chopped nuts, some wet stone, green plum, apple, earth and even a little twist of tangerine and lime. Julien Brocard, Jean-Marc’s son who now heads up the company. The palate is fresh and lively with that driving acidity and a nervy, hesitant style. However, there are richer characters here too. There is a dollop of creaminess that rounds the wine out, there is some green plum, green fig and apple, but most of all there is that stony, mineral quality that is often lacking in Chablis at the cheaper end and makes the wine seem thrilling and taut. A glorious wine for the price that shows how exciting this region can be, perfect as an aperitif, or with shellfish and light fish dishes. I had it with smoked trout paté and it was delicious – 88/100 points. Available in the UK for £11.99 per bottle from The Co-op.